Before you begin the attempt to build a successful list or create a powerful sales page, you will want to start with a rigorous introduction to landing pages. In stark contrast to undifferentiated, unfocused home pages, landing pages focus specifically on capturing leads for a newsletter or making sales for a specific product and make no attempt to give visitors a different option. 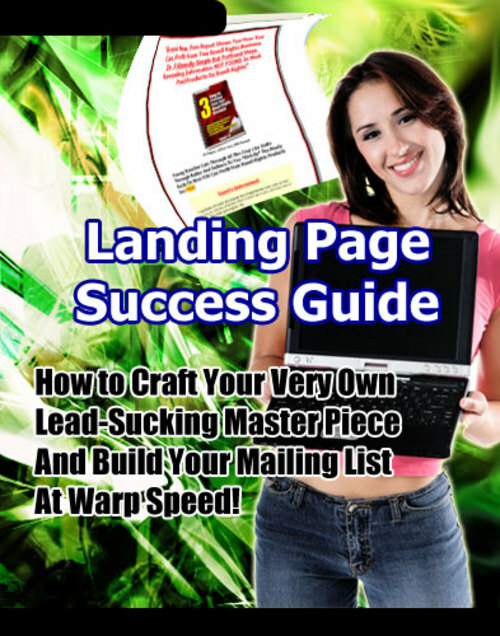 Another common word that is often used to describe landing page, is squeeze page (or lead capture page in some circles). A squeeze page is a page designed to get names and email addresses. Usually, however, a squeeze page is usually a smaller type of landing page, which usually has an opt-in form in sight when the page loads. So what is important to learn in an introduction to landing pages? First, it is important to recognize that all successful marketers use these. If you plan to sell a product over the Internet, you will want to use one, too, rather than relying on sidebar opt-in forms and unfocused pages that do not convey a single point and a single call to action. Another important thing you will want to take away from this introduction to landing pages is that every landing page contains the same parts and is focused on a SINGLE goal getting the visitor to become a subscriber or buyer. These parts are as follows: an opt-in form (or sales prompt), a brief or lengthy introduction, a picture of the list/product owner, the signature of the list owner, and a call to action (or multiple calls to action). Determining which model will work best for you can simply only be done through testing. While many boast a conversion and attribute it to the shortness of their introduction (many will be one short paragraph), otherwise will boast a high conversion rate because they use lengthy, thorough, and compelling copy. If there is anything you absolutely must take away from an introduction to landing pages, it is that you cannot create a landing page or squeeze page that isn't focused.